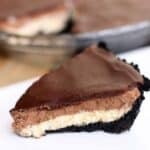 Decadent and delicious Chocolate Mousse Cheesecake with an Oreo cookie crust, cheesecake filling, chocolate mousse, and topped with chocolate ganache. There’s no question about it; if you’re a chocolate lover, you MUST make this Chocolate Mousse Cheesecake. Make it for the holidays. Make it for a birthday. Make it for your coworkers. Just find an excuse to make it! After one bite of this delicious dessert my husband declared it his new birthday cake request. It’s rich, decadent, and insanely delicious. The recipe starts with a simple homemade Oreo crust. Put 24 whole Oreo cookies into a food processor (or use a ziplock bag and a rolling pin) and pulse them into crumbs. Mix the cookie crumbs with melted butter and press everything into a pie plate to make a crust. No need to bake it at this point–just put it in the fridge while you make the cheesecake filling. The cheesecake filling consists of simple ingredients and comes together easily. 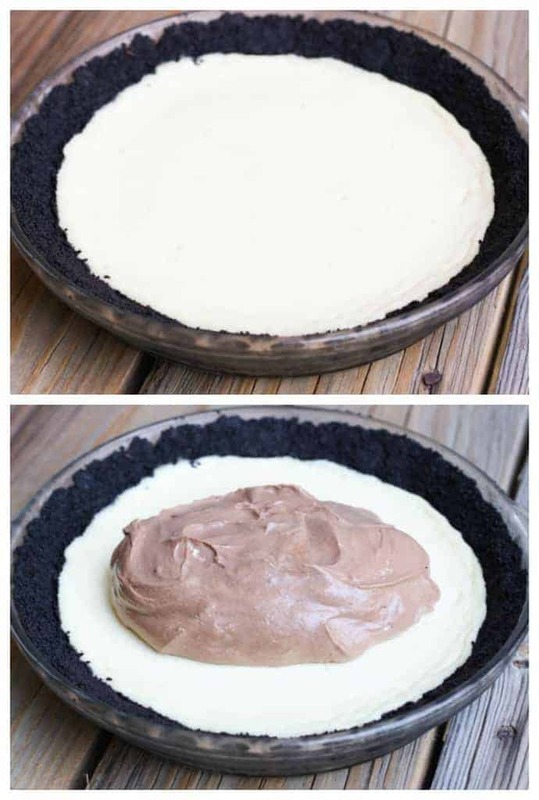 Spread the smooth filling into your Oreo crust and bake the cheesecake until the edges are set and the center is slightly firm (it can be a little soft, just not jiggly). It will set up even more as it cools. 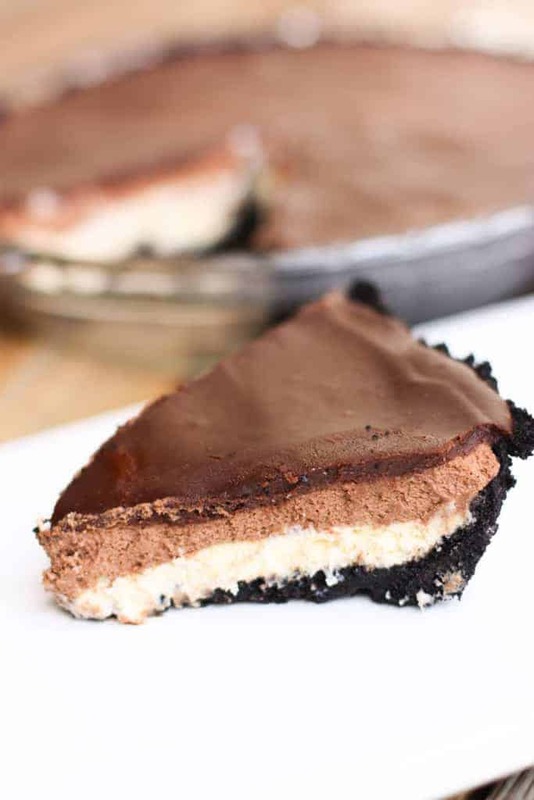 Once the cheesecake is completely cooled, add a layer of chocolate mouse, and then a simple chocolate ganache on top. There are multiple steps to this recipe, but each are simple. This is a great recipe to make in steps, if you don’t want to do it all in one day, or you can make the entire cake 1-3 days in advance and store it in the fridge. Press the mixture into a deep dish 9-inch pie plate, covering the bottom and up the sides of the dish. Refrigerate while you make the filling. Cream together the softened cream cheese and granulated sugar until well blended. Add the egg, egg yolk, and vanilla and mix. Blend in the sour cream. 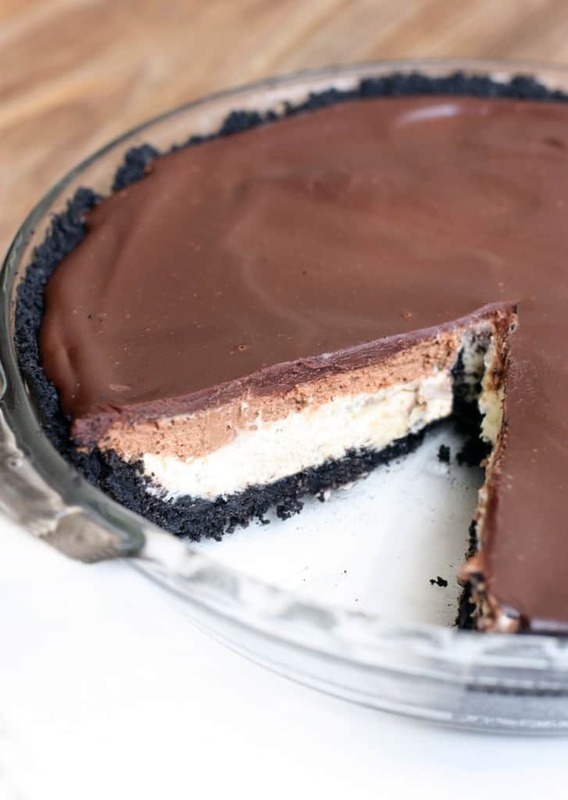 Spread the filling over the Oreo cookie crust in an even layer. Bake at 325 degrees F for 40-45 minutes, or until the edges are set and the center is slightly firm (it can be a little soft, just not jiggly). Remove from oven and allow to cool completely. Heat 1/2 cup cream in a small saucepan until just simmering. Whisk the egg yolks together in a small bowl. Add a big spoonful of the hot cream into the egg yolks and continue whisking until combined. Repeat with another spoonful of hot cream, whisking well to combine. Pour the tempered egg yolks into the saucepan with the remaining hot cream, whisking constantly over medium-low heat, and cook until the mixture bubbles and thickens, 1-2 minutes. Remove from the heat and stir in the chocolate chips, stirring constantly until the chocolate is completely melted and the mixture is smooth. Allow mixture to cool to room temperature, whisking occasionally to avoid a skin forming across the top. Once cooled, beat the remaining 1/2 cup cream to stiff peaks and gently fold it into the chocolate mixture. 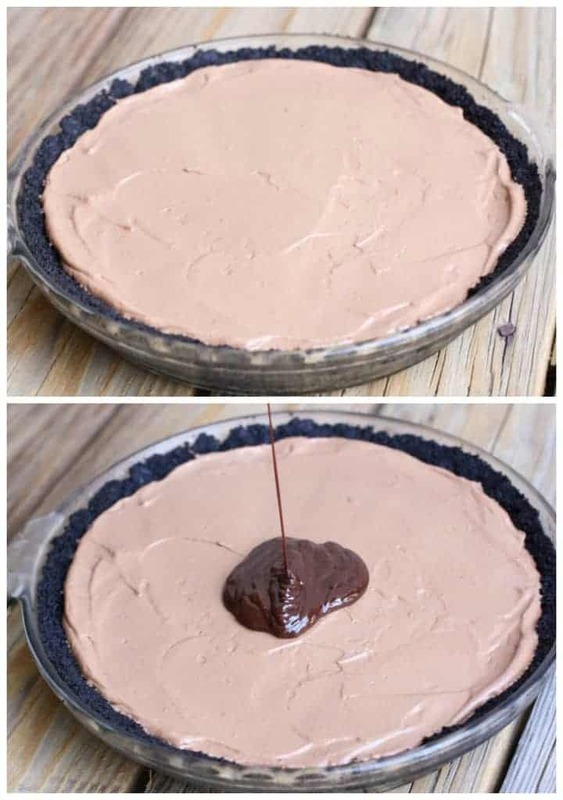 Spread the mousse over the top of the cooled cheesecake pie and refrigerate. While the pie chills, make the ganache. Combine the butter and cream in a saucepan over medium heat until the butter is melted and the mixture is simmering. Add the vanilla and powdered sugar and stir well. Pour the ganache over the mousse. Refrigerate cheesecake until ready to serve (at least an hour - the pie can be made up to a day in advance). Hi! I have made this recipe before and my whole family loved it. I want to make it again, however, this time around I have a guest with a severe egg allergy. Any way to omit or replace the eggs in the cheesecake layer? Thank you! Thank you so much! As for the eggs–I really can’t say. The only thing I could think is possibly unflavored (clear) gelatin. OMG I just finished making it and it is heavenly!!! My boyfriend is going to love it!!! Hi Kathy, that’s fine! Baking time should be about the same. Enjoy!